Space Office Systems specialise in the supply and installation of furniture to businesses in London, providing high quality office furniture, office seating, reception furniture, desks and storage solutions to a wide variety of organisations within the UK. Our detailed understanding of the office furniture market as office furniture suppliers in London, UK - from workstations, office seating, desks and storage solutions combine with a willingness to respond effectively to customer expectations and requirements - all backed by an outstanding portfolio of furniture products that combine high performance with aesthetic excellence. These include office seating and chairs, desks and storage solutions, filing, reception counters, boardroom tables - catering for all budgets and styles. As well as high quality workstations, desks and storage solutions, Space Office Systems are office furniture suppliers in London, UK who can also supply bespoke furniture items such as reception desks, boardroom tables and executive office furniture suites. Our comprehensive 304 page furniture catalogue features more than 60,000 products available from stock - 10 system desking ranges, 10 executive furniture ranges, 15 filing and storage ranges, 17 office chair ranges, 16 executive boardroom seating ranges, 8 accessory ranges. 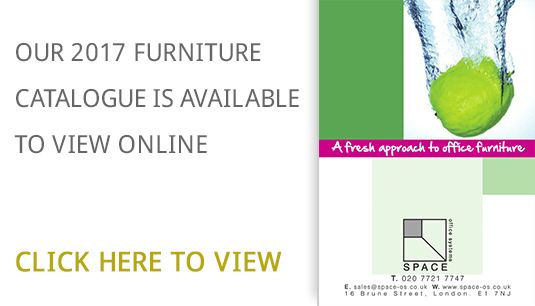 All the office furniture included in our catalogue we deliver and install free.